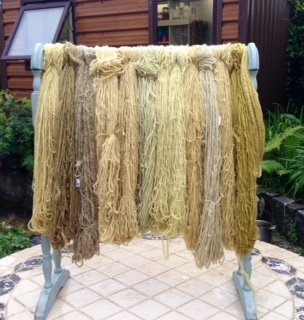 I recently conducted a two-day natural dyeing workshop here at Meet the Wool. The weather was fully cooperative and there was an abundance of plants and flowers available along the roadside. 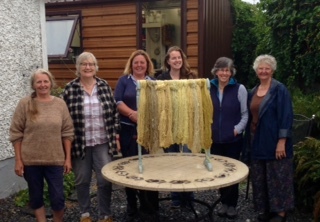 Five lovely, enthusiastic Ladies attended and our first day was spent talking about mordant’s, how and why to use them and some colours that could be produced with them. Then everyone grabbed a bucket and went out to gather dye materials. 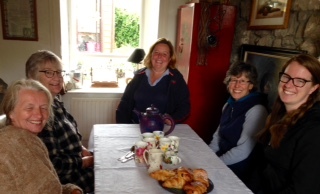 The buckets returned filled with ragwort, cow parsley, thistle, foxglove, brambles, meadow sweet, alder leaves and dock. 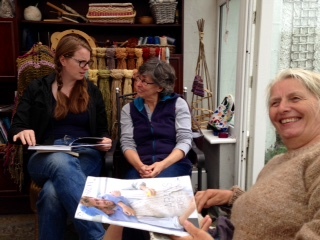 Day 1 ended with mordanting our wool and preparing the plants and flowers. 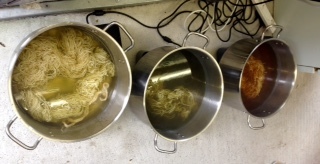 Day 2 was spent busily cooking up the dye baths. The real magic happens when the wool is placed in the bath and immediately changes colour. Our group was excited and very pleased with their results ranging from beiges to greens to yellows. Now out I go to collect and freeze botanicals for use during the winter months. What colours will I get?? 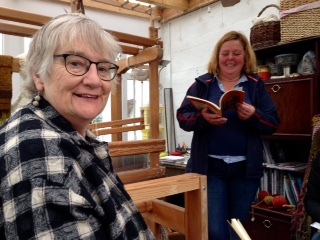 Waiting for the Wool to dye. And here we are, Beige, Green & Yellow.